A new dragon that can shoot Zap that can bounce up to three units/buildings! 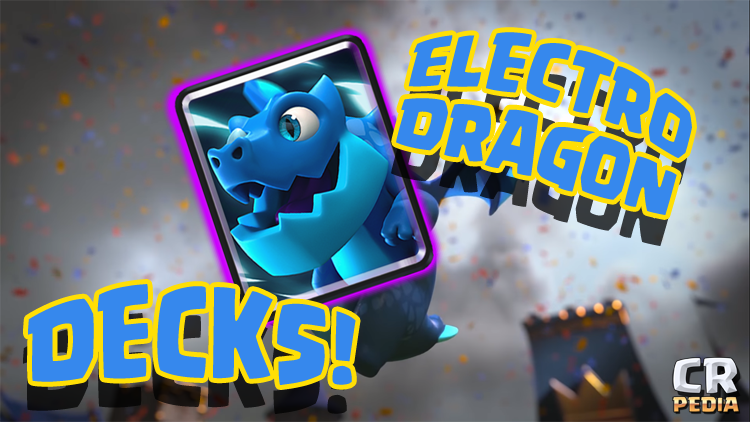 Check out the best Electro Dragon Decks in the game! 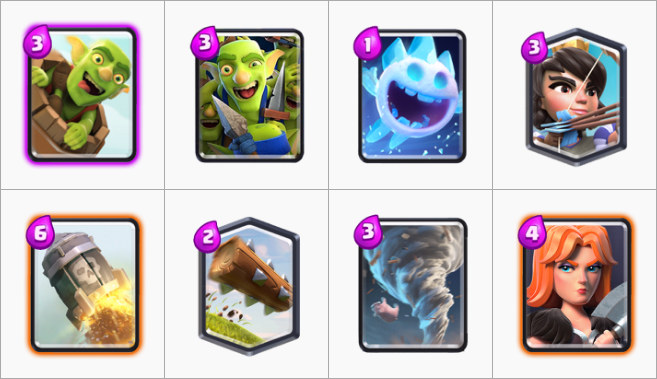 A Giant 3M and Battle Ram deck without legendaries to push for trophies! With the Valkyrie buff this bait deck is getting a make over! Support your Golem with splash and buff him with the L-Jack's Rage! 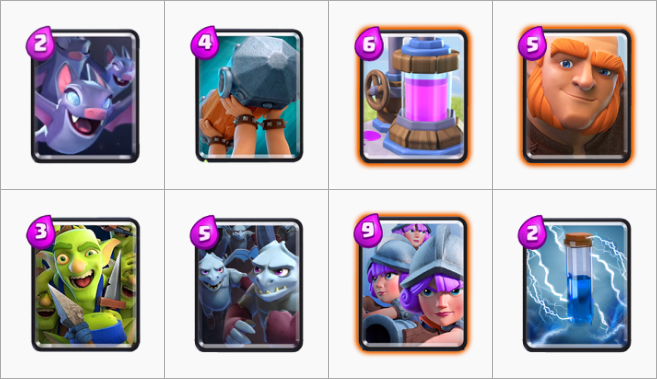 The Broken Mortar, Miner, and Rascals deck that pros want to get nerfed! How are you after the October 2018 Balance update? Strategies to help you and your buddy in 2v2 matches! Tips for you to get a Touchdown! Enjoy Clash Royale more with these Quests! Climb all the way to the top! Best Decks for your favorite card. Get immersed with these popular strategies. Strategies for beginners and pros alike. Prove your strength with these decks. Got a worthy deck? Share it! At Clash Royalepedia, we strive to be the players who bring you the latest popular strategies. We only cover the ones that will be useful to you, the Clash Royale player! With that, each of the above pages cater to a very particular strategy or technique. The Arena Deck Strategies cover strategies per Arena. If you want a deck focused on a particular card, check the Card Deck Strategies. For Popular Decks right now, the Meta page is for you. Also, do you have trouble in countering the Sparky? Do you find it hard to stop the Lava Hound? If so, the 'How to Counter Page' is for you. The page gives Counter Information for each card. yes, even Spells and Buildings. Never get overpowered by the Sparky Again with our guide! Take a look at some of our content in detail! Here in Clash Royalepedia, we tend to help Clashers in the best way we can! How do you build a deck? What are the top decks right now? Is my strategy still good? Is it now obsolete? Should I add this card to my deck? Should I remove the Minion Horde? Check some of our notable articles in the table below. These articles are our most visited pages. This information lets us gauge our readers that most of them are in Arena 9, 10, and 11. If you're still in lower arenas, feel free to go to our Arena Deck Page so we can help you move up. Join the Goblin family together with the Bandit and Executioner. We will help you take the last step towards the Legendary Arena. Clash with the best players in the world using these decks. Swing the PEKKA sword for that perfect counter-push. The tankiest and jumping tanker in the game. With new cards being released every month, we will bring you the best decks there is to utilize your new troop. We understand that every time you unlock a new card you will feel the itch to use it, whether it's a new support card, tank card, or even spell card. We will give you the best decks that complement that card's strengths and weakness. In this section, we will give you the last three cards released in the game. Tapping or clicking on the image will get you straight to their Deck Indexes. The mobile and fast Cannon on wheels. The Current Meta decks are the decks and cards that are most currently used right now. These are the Clash Royale decks you will encounter in the higher Arenas. These are the decks that you will see in competitions. But first, a few things. The Meta always change. Your deck last month will be trash today because of the Balance Update. Have you been using Zap? Too bad, it can't kill the Goblins now. The Meta page will provide you details on what are the biggest decks right now. If your deck can't stand against them, maybe you should use those decks as well. Find information about our staff here. (And now for some legalese!) Please note that Clash Royalepedia is not affiliated with Supercell! We are an independent Clash Royale Decks Strategy website and will stay like that for as long as we can! You would like some coverage of your YouTube videos. We're cool with YouTubers and we hope you can partner with us for some content cooperation! Something is wrong with the site. If the is the case, please let us know immediately.